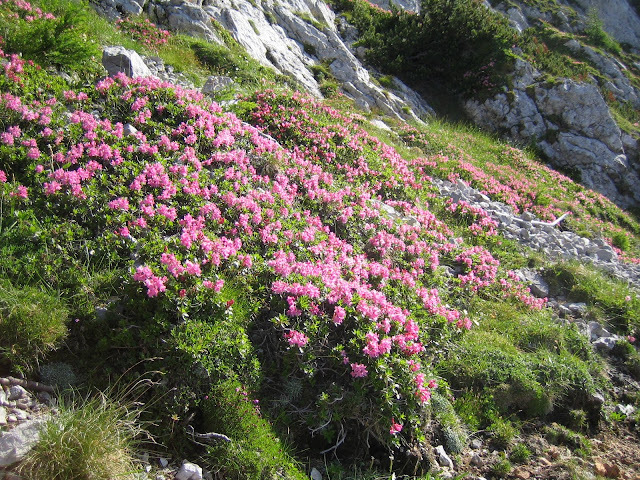 For Intermezzo: I am sending My pictures of Rocky gardens from the mountain of Raduha (June). fantastic photos and I would think fantastic experiences.. I can see where you got your inspiration for your garden. Those flowers are Rhododendron, and the purple flower is a Penstemon or a Mimulus? what kind of pine are in the hiking photos from Slovenia? The purple plant its - Acinos alpinus! A spruce and a larch are prevailing in mountains of Slovenia, on highest positions knee pine. would you also know the Latin name for the 'knee pine'? is it one of the Pinus mugho group? Yes, it is one of the Pinus mugho group! Wonderful bush is for rocky gardens.